My craft room is always in need of improved storage and organization. When I saw these bright and colorful prints from Doodlebug's new Flower Box collection, I knew they would make perfect storage boxes. I used this 3D box file from Silhouette to die cut my boxes. I increased the size of the boxes just a bit so they would accommodate my pearl and jewel packs. Because I increased the size of the boxes, each box required two 12"x12" pieces of paper. I used the coordinating B sides for the corners and label holder. Did you notice how I attached each label holder with the appropriate embellishment? Each box measures approximately 4.5"x5.5"x3.25"--small enough to be cute, but big enough to be functional. I totally plan on making more of these for my craft room. Each box has coordinating woodgrain corners. I LOVE the multi-colored woodgrain prints in Doodlebug's Flower Box collection. There's a pink woodgrain print, too. What would you make storage boxes for? How cute! Such a great idea and love the bright happy colors! 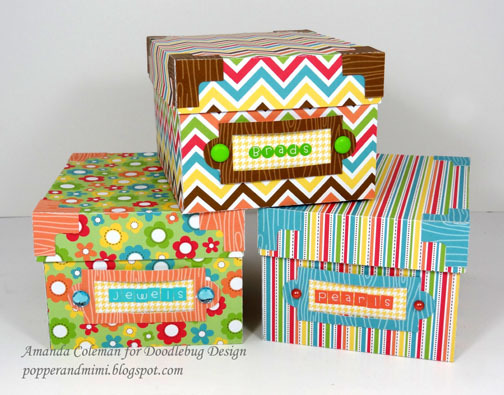 These storage boxes are terrific and I love the papers you coordinated together. I would use boxes like this to store all the handmade cards I made! What a great idea! These would be PERFECT for storing cards! 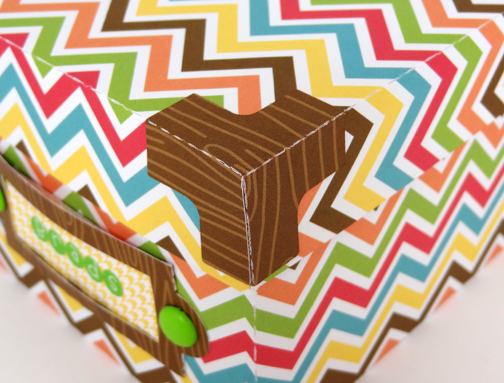 What a great idea--these boxes are really cute! Great idea, cute and colorful. love it. I need a Silhouette...there is so much you can do with it. Loving the boxes, such pretty storage for your bling. I really wish I had a silhouette so I could make one of these, but I'd be okay with the prize. Neat idea. Could fill them for Easter! Useful and pretty! just love this collection. Can't wait to find it somewhere!! Or win it!! What a cute idea to be able to customize storage boxes. I just emptied some plain photo boxes and wasn't ready to get rid of them. Now I know why! I'm inspired to use these ideas to decorate them and label them! I am always looking for storage ideas. Right now my stickles are driving me crazy. I am thinking that these boxes, in the appropriate color could house my stickles. I love of pretty boxes started early. As a child I would keep my special memento's and toys in them. I think this would make a great little keepsake box for a child as well. These are so colorful! 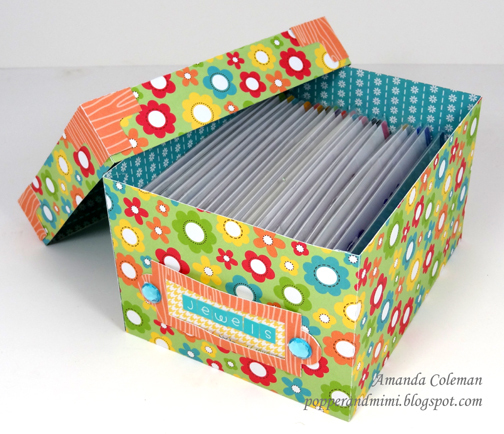 I like all the ideas - storing embellishments and handmade cards. I was thinking clear stamps too! Super cute and functional. Great ideas - thanks! These boxes are fabulous! So many great uses for them and the paper is beautiful too! Very cute idea! I really like the bright colors of the collection! They really make the boxes! Great idea for storage ! I love the bright colors they are so uplifting ! wow!! what a great idea! i would make a box for my stamps, a box for embellishments, and a box for misc photographs! Those are super cute!! I love all the patterns, they are so bright! I would put embellishments in them just like she did! Fun boxes! I'd make them for my stamp room and storing all my embellishments! OMG!! These have just moved to the top of my To Do List! These look great. I think that I need some.. So stinking cute. I wouldn't have thought of these for jewel and bling sheets but how genius and cute to boot! Very clever and so cute. Love the storage box idea. Love the wood grain corners! So cute! Very nice...I could use a couple for my ribbon! Love this! Cute, cute, cute. I have lots of things to put in these boxes.....guess what I'll be doing. Thanks for your idea. So cute! I love that you added the corners! Love it! What a colorful and great project. I have to try it as well. I wonder how you manage to cut the design to make it bigger. Storage boxes are a great way to free up space in your file cabinets and archive documents you don’t need to consult every day, but can’t throw away.